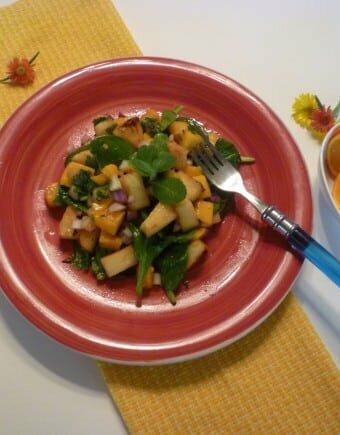 Recipe for a refreshing and easy Tropical Fresh Salad with Grilled Mangoes and Pineapple tossed with Spiced Citrus Vinaigrette Dressing. So delicious! Exotic and luscious, rich in vitamins, minerals, and antioxidants, mango is one of the most frequently consumed fruits in all of the world. Originally from South Asia, it is now cultivated in virtually every country with either a tropical or subtropical climate. There are about 500 to 1,000 different cultivars of the fruit. 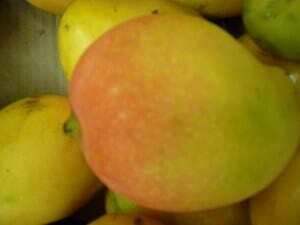 In Brazil, one of the most popular is the Pink Mango (Manga Rosa) with its yellow coloration and pink blush. It is both sweet and richly aromatic. It is utilized in a wide range of different dishes– e.g. fruit cocktails, mousses, juices, smoothies, ice cream, fresh salads, among others. Standing mango upright, cut two lengthwise slices, each about 1/2 inch thick, from the broad side of the mango pit. Cut the flesh into a checkboard pattern, being careful not to cut through peel. Push on the peel side to turn the slice inside out. Slice off the resultant cubes. Place them on a piece of heavy duty aluminum foil with the chopped mint, and either drizzle the cubed mango with honey or sprinkle with brown sugar. Enclose in sheet of foil, folding in half and then folding the ends closed. Next, place over a hot grill or a ridged grill pan over moderately high heat in same manner. Let cook for about 4 minutes per side. Remove from foil. Let cool down at room temperature and refrigerate for about 30 minutes. In a small bowl, combine honey, lime, and black and red pepper. Brush the glaze onto each slice of pineapple, coating completely. Preheat barbecue grill or a ridged grill pan over moderately high heat. Either oil or spray the grill rack or pan with non-stick cooking spray. Place pineapple slices on the grill and cook approximately 4 minutes on each side (turning so that grill marks are on all sides). Remove from the grill or pan and brush with any additional glaze one more time. Remove from grill or pan. Let cool down and cut into smaller pieces. Refrigerate for about 30 minutes. 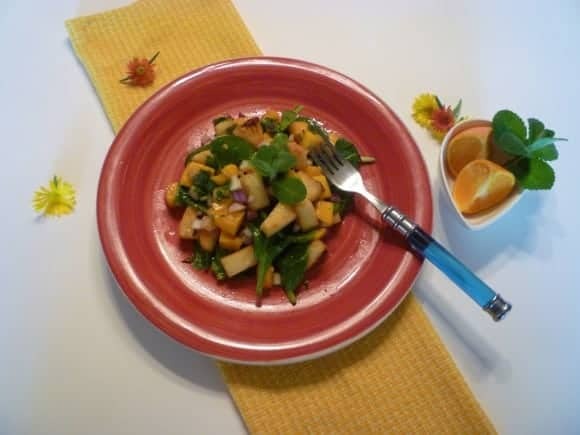 Combine the grilled mangoes and pineapple with the small diced onion and cilantro. Place on top of the salad leaves. Drizzle with the vinaigrette, mixing gently. Add the nuts. Serve. For the vinaigrette: In a medium bowl, whisk the extra virgin olive oil with both the lime and orange juices. Then, add the honey, salt, peppers, cinnamon, and nutmeg, whisking until well combined. Drizzle the tropical fresh salad. Mal posso esperar para comer essa salada! Vou tentar assim que puder, parece ser deliciosa. Obrigada, Danuza! É uma das minhas favoritas porque e super refrescante e deliciosa. 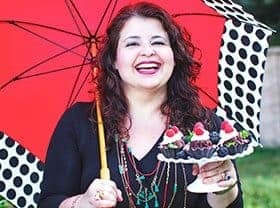 É uma verdadeira combinacao de sabores: Amargo, azedo, salgado, doce…e texturas também. Enjoy!